This costume was made for the production of Elizabeth, though it is barely seen, and never in full. Thankfully, it was used again a couple of years later for David Starkey's documentary on Elizabeth, and we are given a full view of just how beautiful this gown really is. 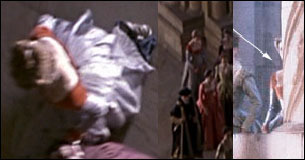 It is seen again on a courtier in the first season of The Tudors.